Enhanced Birthday Feature: Customize how your BlackBerry smartphone will integrate birthdays into your calendar. Receive a friendly daily reminder, with the ability to directly write on a friend's wall to wish them Happy Birthday. Improved Event Management: View Facebook event information and RSVP to events, as well as post comments to an event wall, view profiles of invited guests and receive event notifications. Updated Navigation Grid: Quickly and easily access key features such as your News Feed and Profile with updated icons. The Profile icon is now your current profile picture for a personalized touch. 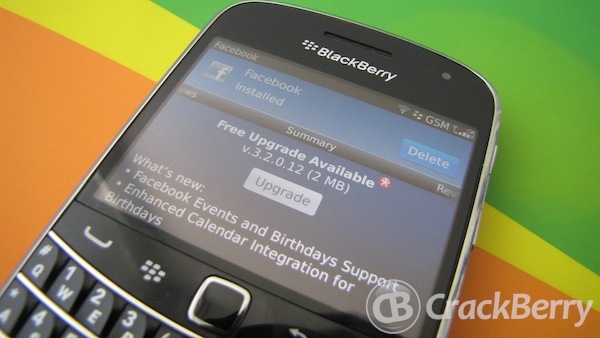 You can grab the update free in BlackBerry App World from the link below. Thanks to @dwdsquared2!